Broadbelt explained that chefs, while wearing gloves can remove the spiky, venomous top, bottom and dorsal fins with kitchen shears• Once finless the soft scales can be scraped away and the fish gutted in the normal way as the fish itself is not poisonous. 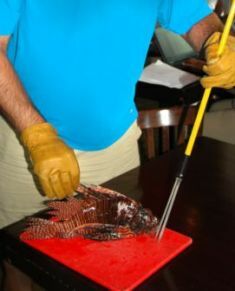 He explained that restaurants can help in the goal to destroy the predatory Lionfish before they are big enough to reproduce by serving them up on local menus and encouraging the community to acquire a taste for the succulent white fish. Broadbelt said local divers are also encouraging sea life to also add the lionfish to their diets by feeding them to moray eels, snappers, nurse sharks and groupers and encourage them to develop a taste for the finned marauders and hopefully join in the cull. So far over 5000 fish have been bagged by trained divers this year and the need to stop them reproducing continues a single fish can produce two million eggs annually.